John mututho wants transformed the alcohol sector by introducing mututho laws.Before mututho laws Kenya was a drinking nation with bars never closing but his laws transformed the nation. Mututho this week made headline by trying to ban slay queens favorite drug, shisha. 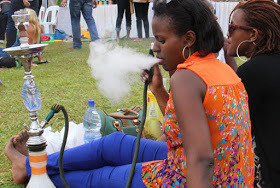 Mututho wants laws introduced to ban shisha in the country just like Rwanda has done . "Little is known about the composition of Shisha consumed locally, especially the possibility of adulterated with prohibited substances." "While all the samples tested negative for marijuana and cocaine, they all tested positive for opiates," Mututho told journalists in Naivasha on Sunday. If banned, mututho will be slay queens number 1 enemy because slay queens without shisha are nothing, it signifies their rachetness and gives them a sense of belonging.